Separate the dates from any attached stems, pit them if necessary, slice/chop thinly and cover with the boiling water and bicarbonate of soda to soften. Place the butter and sugar into a pan and heat slowly until they have melted. Add the cream and a pinch of salt, increase the heat and bring to the boil. After about 4 minutes, the sauce should have thickened enough to coat the back of a spoon. Use half of the sauce to cover the bottom of your muffin tin thingies. Put the remainder in the fridge to chill. Preheat the oven to 180°C (356°F). Take the dates out of the water - but keep the water. Beat the sugar and butter until fluffy, then beat in the eggs, a bit at a time. Stir in the flour, baking powder and a pinch of salt. Then add the dates and some of the water they were soaked in and mix well. If the mixture is too dry, add more water. Spoon the mixture into your muffin tin and bake for 25-30 minutes. You can test whether they are done by inserting a skewer into the centre - if it comes out clean, the pudding is cooked. When ready to serve, heat up the remaining toffee/caramel sauce. Pour a little sauce over each pudding and serve with vanilla ice cream. The video above is from the Keef Cooks YouTube channel. 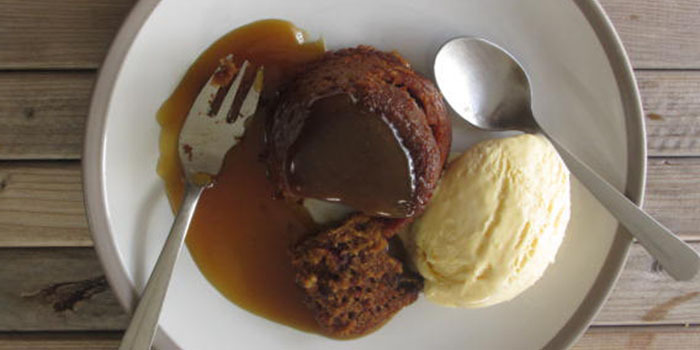 Click here to see the video recipe of Sticky Toffee Pudding on YouTube.